Zoning allows homes or offices to be divided into separate temperature zones, in essence room to room temperature control. 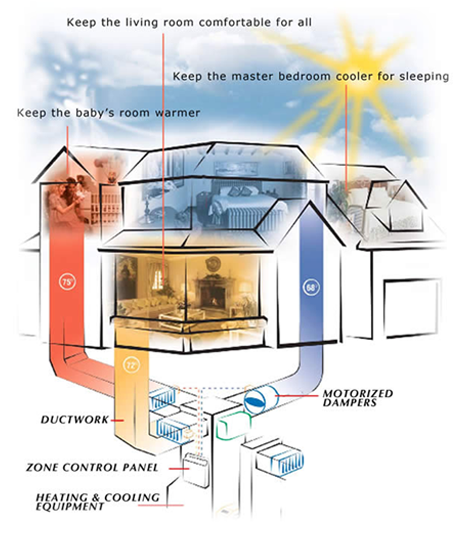 Zoning is capable of providing this by putting a thermostat in each room or (zone). The thermostat then signals an automatic air control damper in the duct for that room or zone which controls the flow of the conditioned (heated or cooled) air. With zoning, only the area(s) needing conditioned air get it, while areas that are already comfortable do not. This solves the problems of rooms becoming too hot or too cold. The introduction of a zoning system is one of easiest ways of making your HVAC system energy efficient.